Successful Fundraising Tips for Your Student Orgs! For current or prospective students, there are two things you learn very quickly about involvement in student activities and running a successful student organization: (1) you need to fundraise for most of your organizations, and (2) it can be challenging to raise money on campus. College students are not billionaires with expendable incomes and there are over 500 student organizations on campus also hosting their own fundraisers and events. Although fundraising may be challenging, it is not impossible! Over my past three and a half years at UConn, I have been fortunate enough to be involved with various organizations on campus and host a wide array of fruitful fundraisers—from cake pop sales at the Student Union to hosting campus-wide events like UConn’s biggest water balloon fight, USplash. I have also worked on various social media marketing campaigns and projects on campus that have yielded impressive results thanks to the collaborative efforts of members, student groups and the UConn community. 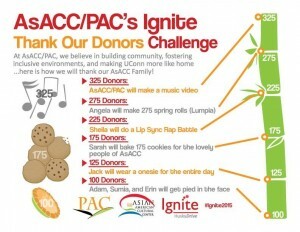 Currently, with the Asian American Cultural Center’s Pan-Asian Council (AsACC PAC), I am participating in a crowd-funding competition through the UConn Foundation called Ignite. This is a competition that awards up to $10,000 for the student group that manages to get the most number of current student and young Alumni donors to support their cause. With this competition, your marketing strategy and reaching out to those who support your cause is crucial. Four weeks into this event, AsACC PAC has over 125 donors and raised $1,300! We are working on ways to make this fun and rewarding for both our organizers and supporters in the coming weeks. Coming up with different challenges, videos, and social media marketing efforts, I have a lot a fun working on Ignite and want to share my tips and tricks with you all! Know your purpose: It is crucial to understand the purpose of your organization’s mission, the objectives of your efforts, and the goals of your fundraiser. If you or the other members do not understand why you want people to donate, you will not be able to someone why they should support your cause. Know your target audience: Are you hoping to reach current UConn students, a specific demographic within the UConn Community, or fundraising within your organization? Understanding whom you are hoping to reach is key to understanding how to approach them. Think outside of the box and be creative: If you know that there are 4 different bake sales going on in the Student Union mall at the same time as yours, how will you stand out? Have fun getting creative with your approach to getting donors or participants! For AsACC PAC’s Ignite, we wanted to thank our donors and show appreciation for their support by being silly, so we created a “thank our donor challenge” (see image). Marketing and social media coordination is key: Anyone who manages a social media account for an organization understands that there is more to social media marketing than just hashtags and Facebook likes. Here are some useful tips! Collaboration and Synergy: Although it may seem like there is great competition for funds, collaboration and bringing diverse groups and student leaders together can work well for your cause! 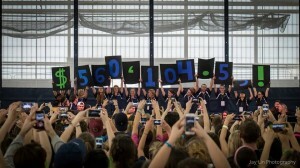 HuskyTHON brings together over 100 teams of friends, fraternities, sororities, student athletes, and different student groups to raise funds for the Connecticut Children’s Medical Center every year. 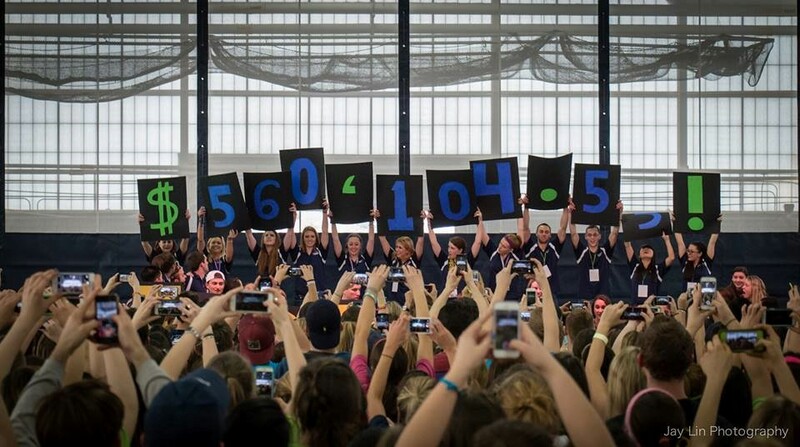 This year their collective efforts across campus helped raise over $500,000 for the kids! Reach out to other student leaders, groups, or student activities for help, co-sponsorship or even advice. You would be surprise how many people are willing to help, if you are willing to ask. Professionalism: For any fundraiser or event, it is important to know that you are representing your organization to potential members, collaborators, supporters, and even customers. Try getting free business cards, staying on top of email correspondence, and show up early and be prepared. Whether you are trying to reach your Relay for Life or HuskyTHON goal, raising money for your organization to get t-shirts, or competing in a campus-wide crowd-funding competition for $10,000 like Ignite, use these tips and you’ll find that fundraising can be fun! For more information about the different student-led causes you can donate to, visit Ignite! This entry was posted in Clubs & Organizations.